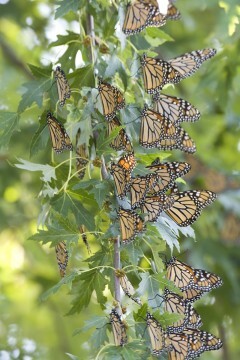 Many people now have their eye on the population numbers of the monarch butterfly. A species that numbered 1 billion in 1996 hit an all time low of 25 million butterflies covering 0.67 hectares on their overwintering grounds in Mexico in 2013/2014. In 2013 The World Wildlife Fund declared the Monarch Migration endangered and in 2014 an official petition was made to US Fish and Wildlife Services to give the monarch butterfly protection under the Endangered Species Act. On Friday, February 27 the 2015/2015 overwintering numbers were released. They showed good progress toward recovery with 4 hectares covered with 150 million butterflies. This number represents 68% of the 22 year average and 2/3 of the way to the target population of 6 hectares. But what happened that caused the concern in the first place? The easy answer is loss of habitat. The monarch caterpillar eats only one family of plants-milkweed. You often see milkweed growing on the side of highways and it was once very common in crop fields. There was enough milkweed to support hundreds of millions of monarch caterpillars. With the invention of GMO crops, that tolerate being sprayed by herbicides, the monarchs have lost the millions of acres of milkweed that once grew in between the row crops. Additionally another 2.2 million acres per year is lost due to development. All this adds up to a shortage of plants for the female to lay her eggs on and the caterpillars to eat. But there is hope. A large effort is underway, in Kansas City and across North America, to plant milkweed and other native, nectar plants for the monarch in its breeding grounds and migration corridor. Over 500,000 people wrote in support for protection of the monarch . Individuals, schools, parks and other public spaces are playing a big role in the recovery of the butterfly. There are over 45.6 million acres of yards in the US, mostly filled with turf grass. If everyone planted a little milkweed, along with some native nectar plants, the monarch would regain some of the habitat they have lost. A recent study showed that monarchs actually prefer garden habitat for egg laying. 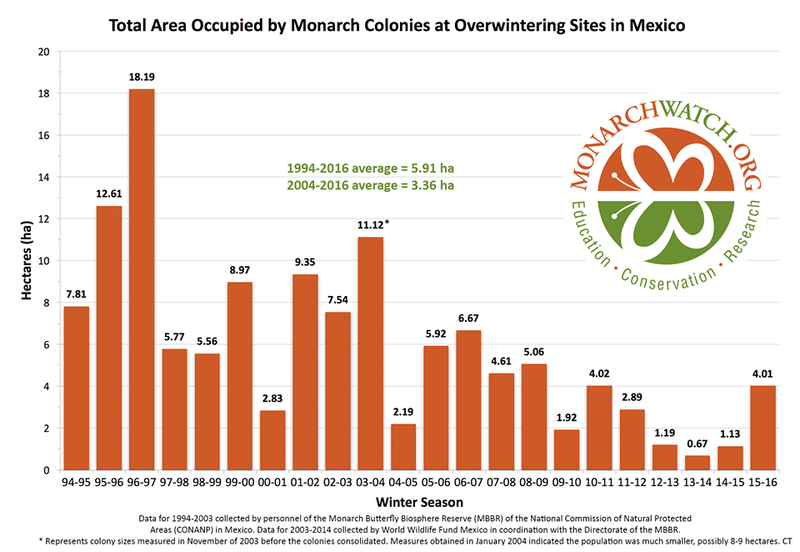 Monarchs oviposted (lay eggs) anywhere from 2.0 to 6.2 times more in gardens than in natural areas. -Plant at least a couple different species of milkweed. Some favorites are Swamp milkweed (Asclepias incarnata), Butterflyweed (Asclepias tuberosa), Spider milkweed (Asclepias viridis)and if you have room- the Common milkweed (Aclepias syriaca) often seen growing on the side of the road. Common Milkweed is a monarch favorite. Just beware, Common milkweed will spread and so give it lots of space. -Plant native nectar plants with different bloom times for the adult monarchs. Try coreopsis, monarda, coneflowers (lots of native species to chose from, liatris, asters and goldenrods. A few monarchs re-migrants may make it to KC in April. We are at the very northern part of the range for those butterflies returning from Mexico. The first generation will start to show up in May. If you want to check for monarchs in your yard, carefully look under the leaves of the milkweed for the small, white, football shaped eggs or the striped caterpillars gently munching away. Burroughs Audubon will once again be having 2 spring plant sales. One at the Backyard Bird Center, 6212 NW Barry Road in KC North (Shopping Center on the NE corner of I-29 and Barry Road) on Saturday, April 16 from 9am-2pm. The second will be at Weston Bend State Park, 16600 Hwy 45 North Weston, MO at the Bee Creek entrance to the park, from 9am-3pm Friday, May 13th and Saturday, May 14th.